Why does the ring finger not move independently? Why is it that we need to move little finger in order to move ring finger with it? For example, put your palm on a table and fold your middle finger inside. You won't be able to move your ring finger unless you move your little finger along with it. Why? Paul Gilbert and Buckethead and various other guitarists are the only people that I'm aware of that use the ring finger and looks independent. Is it possible to have surgery to make the fingers independent or is it not functional to do that? As you see (click on the image to see full version), the fingers contain extensor muscles for movement. However, the index finger and the little finger have separate extensors, because of which they can move more independently as compared to the middle finger and ring finger, which contain a common extensor muscle called extensor digitorum. Some people lack the interconnections between these extensors, and can thus move their ring finger quite easily. One can also achieve this through practice. 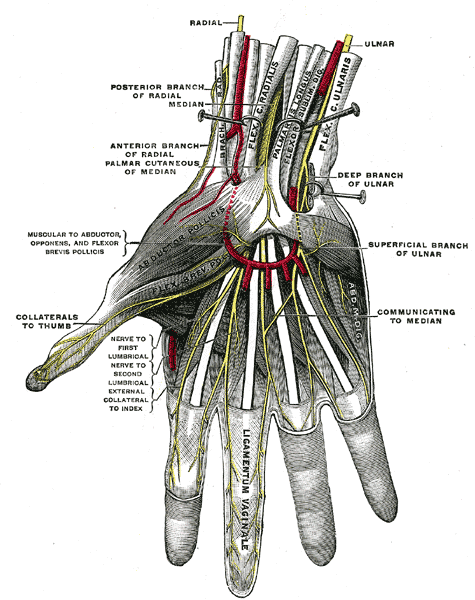 As you see, the branching between these nerves is what causes dependence of the fingers on each other for movement. Since the nerves for ring finger and little finger are intertwined, it becomes difficult to move each of these fingers separately. Similarly, you may find it easier to move your ring finger along with your middle finger. But you can easily move your middle finger independently because it gets signals from radial as well as ulnar nerves. Thus, it is the combined effect of muscular and neural anatomy of ring finger which causes this effect. PS: Since the effect is due to the neural and muscular anatomy of the ring finger, I don't think surgery would help in this case. Wikipedia contributors. "Extrinsic extensor muscles of the hand." Wikipedia, The Free Encyclopedia. Wikipedia, The Free Encyclopedia, 29 Jan. 2017. Web. 27 May. 2017. Not the answer you're looking for? Browse other questions tagged human-biology biochemistry human-anatomy or ask your own question. Why can't we move our toes and some fingers separately? Why does the sweat of children not smell like adults? What is the evolutionary cause for various finger lengths? Does the anatomy of our hand result in (computer) mouse-accuracy that varies by direction of movement? How does a Plasmodium move? Does the humeroradial joint move medially/laterally? Why does the right bundle branch not have any terminal filaments in the IVS of the human heart?